Sawaki Kodo became abbot of Antaiji in 1949, when the temple was still located in northern Kyoto. Sawaki Roshi was the Zen master who brought the degenerated Zen of the 20th century back to its roots: The practice of Zazen without the expectation of gain. 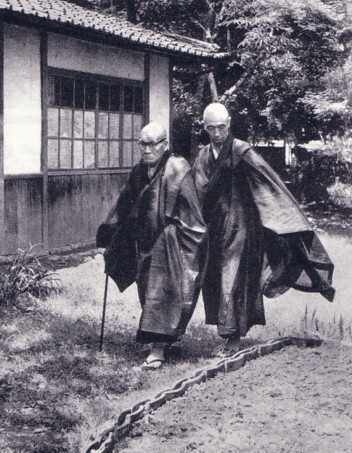 Together with his student, Uchiyama Kosho Roshi, he transformed Antaiji from a place for the intellectual study of Buddhist texts like the the Shobogenzo, into a place for Zen practice based on pure Zazen. 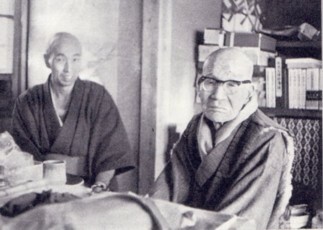 Uchiyama Roshi, who ordained with Sawaki Roshi in 1941, took care of Antaiji, while Sawaki Roshi travelled all over Japan to conduct sesshin (intensive weeks of Zazen) in many places of the country. Each month, of course, one of these sesshin took place in Antaiji as well. In 1962 Sawaki finally settled down in Antaiji because he had gotten weak in his legs. At Antaiji, Uchiyama took care of him until his death in December 1965. Instead of the customary large-scale funeral services, Uchiyama Roshi decided after Sawaki Roshi's death to conduct a memorial sesshin for him - 49 days long. Thus he emphasized Sawaki's stress of Zazen, which can never be replaced by rituals and services. The 49 day sesshin also became the start of the new "Antaiji style" sesshin: Sesshin without toys - no dharma lectures, no sutra reading, no talking, no kyosaku, no samu. After Sawaki's death many students started to gather around Uchiyama at Antaiji, who became known throughout Japan and all over the world through his many books. One of those was "Yadonashi Hokkusan" ("The Dharma of Homeless Kodo"), published in 1972 - a collection of Dharma words by Sawaki Kodo with commentaries by Uchiyama Kosho. This book was translated by Ichida Koshi into English and published together with "On Sawaki Kodo Roshi's Zazen" (translated by Okumura Shohaku) as "The Zen Teaching of 'Homeless' Kodo" (available through the Soto Zen Headquarters in Tokyo or through Zen centers in your area). "The Zen teaching of 'Homeless' Kodo" contains 64 out of the 71 chapters of the Japanese original "Yadonashi Hokkusan". You can find a translation of 31 chapters, including the 7 chapters which are not part of the printed version, here. We have also translated "To you", a collection of sayings by Sawaki Roshi, collected by Uchiyama Roshi and edited by his disciple Kushiya Shusoku Roshi.